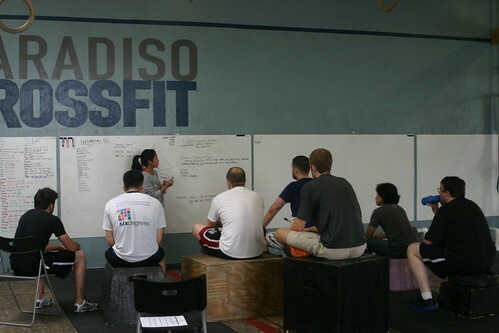 Home » WOD Blog » Summertime, and What You’re Doing Today. Summertime, and What You’re Doing Today. In this scheme, perform 3 Push Press, rest 60 seconds, perform 3 Pause Front Squats, rest 60 seconds, repeat 4 more times. A pause front squat is, rest for 3 seconds at the absolute bottom of the squat, then bounce off your calves to drive back up. Rest no more than 15 seconds after the run to pick up barbell. Set begins at rack position, set ends when barbell drops below rack position. Goal is as many reps as possible, each round, without dropping the bar. You may rest at the rack or overhead. Assassin throwin’ down the knowledge. We’ve been doing a lot of barbell work lately, and of the unconventional sort: 3 Position Snatches, 1 1/4 Front Squats, etc. These drills are excellent for developing the timing and flexibility necessary for proficiency in the Olympic Lifts. Have fun with them, attack them, accept them as a natural part of your journey towards becoming a badass CrossFitter. Summertime is upon us! Post what you plan on doing today and night, to comments. By the time you read this, I am probably running around SF with my family having fun before the cousin’s wedding. But the hotel has a pool and gym, so I’ll be making a mess there too. Your turn!